We all want healthy teeth, hands down. But you could be compromising your oral health with out even knowing it. When you go down the oral health aisle at the store the shelves are packed with products. Everything from toothbrush to portable flossers. It can be hard to know what to buy. Which products are good? And are some of them bad all together? Let’s take a look. What are some ways that you can improve your dental health? There are several different things you can do to improve your oral health. One way is to use a soft bristle toothbrush. This sounds simple but most people don’t pay any attention to the type they are using. And it actually does matter. A lot. Hard bristle toothbrushes are exactly like they sound; hard. The bristles are much more stiff. 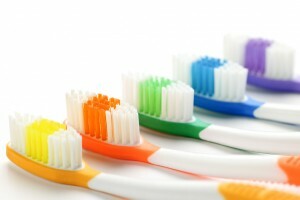 If you use a hard bristle toothbrush it can irritate the gums. The hard bristles brushing against the gums can cause inflammation. It can also cause the gum tissue to recede, or move back, away from the teeth. Hard bristles are very abrasive to the sensitive gums. A brush with soft bristles will allow the bristles to move gently in the mouth. This motion will allow them to get under the gums and clean deeper. When brushing, you should focus on the hard to reach areas of the mouth. Particularly the back of the mouth and those hard to reach last few teeth. These areas are more prone to cavities as they can sometimes be missed when brushing. Using a soft bristle toothbrush, brush the teeth in a circular motion. And be sure to get every surface of the teeth. Tiny food particles and bacteria can stick to any part of a tooth. It’s important to brush morning and night. It can also be effective to brush your teeth after meals to clear it of debris. Taking great care of your teeth will help them to last a lifetime.